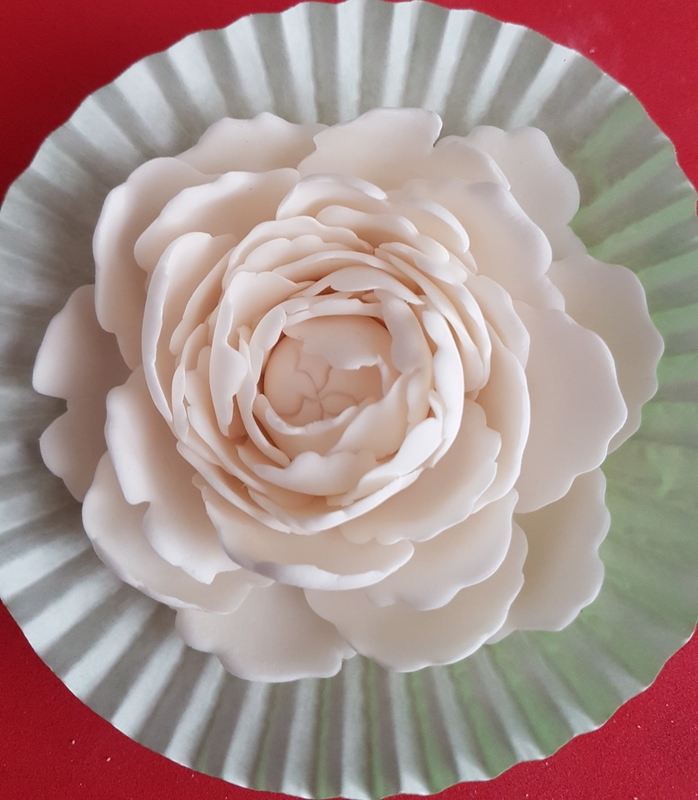 I have previously written about how easy it is to make roses and carnations using the FMM Easiest Ever range of cutters, so today I thought I would show you how easy it is to make a beautiful peony using the FMM Easiest Peony Ever cutter. 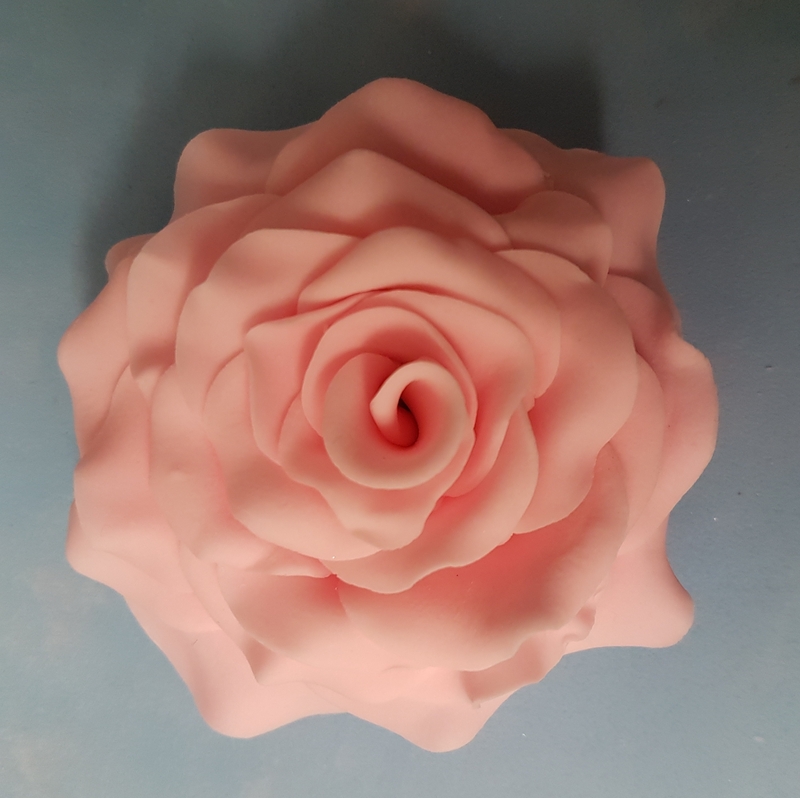 (If you want to see the rose tutorial CLICK HERE, and if you want to see the carnation tutorial CLICK HERE). Peonies are absolutely stunning flowers, giving huge blooms of beautiful colour. They were used on the Royal Wedding cake of Prince Harry and Meghan Markle (or the Duke and Duchess of Sussex, to give them their proper titles). 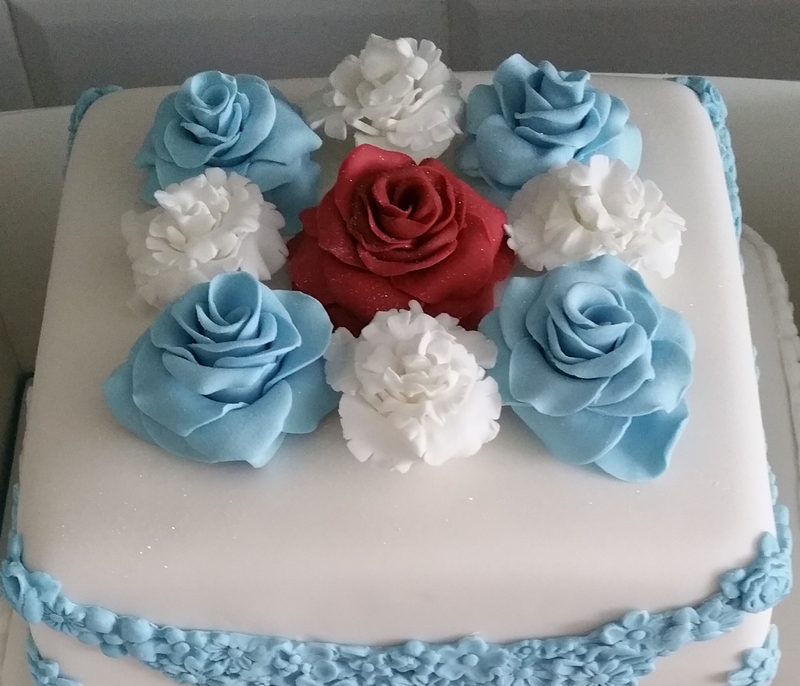 I made a wedding cake inspired by the Duchess, and whilst the Royal Wedding cake used real peonies, mine used one made using the FMM cutter. 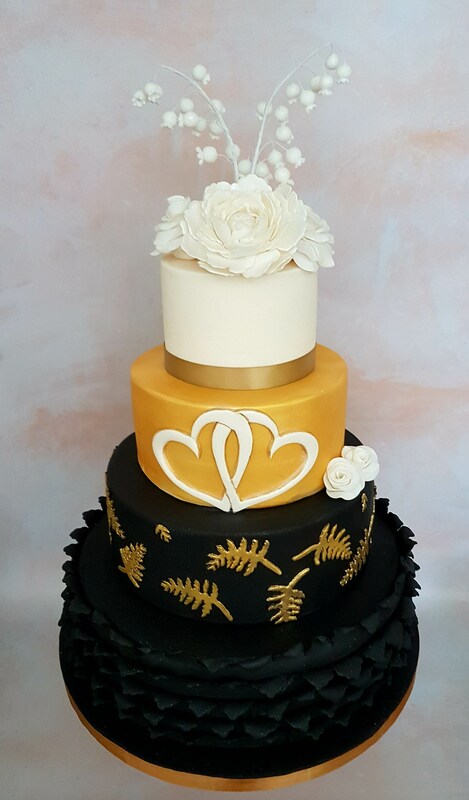 The cake design was based on Meghan’s tastes… the bottom two tiers were inspired by her stunning engagement gown (frilled black skirt and gold fern on top part), the entwined hearts symbolised the union of their love, and the top tier had roses, a peony and lily of the valley. 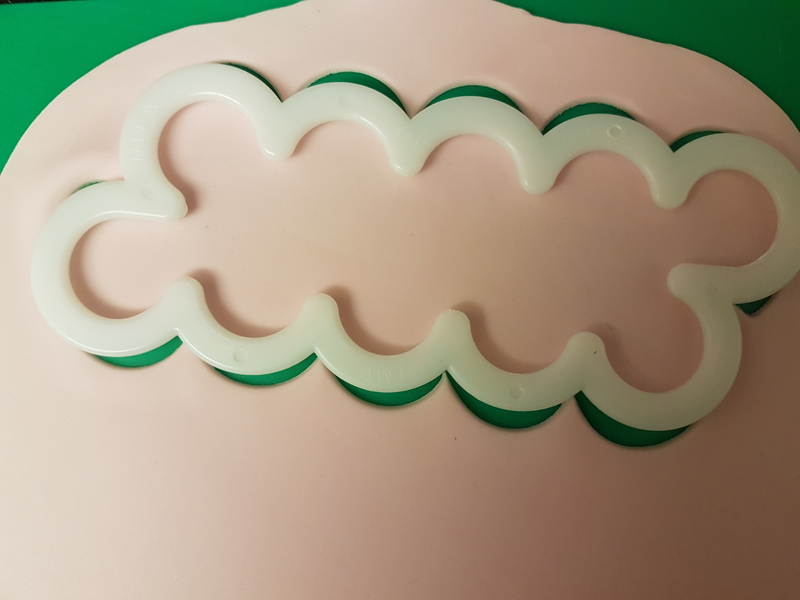 The whole design used nothing but FMM cutters, as they are a brand I love and trust, and they always guarantee beautiful results. Today we’ll just focus on how to make the peony. 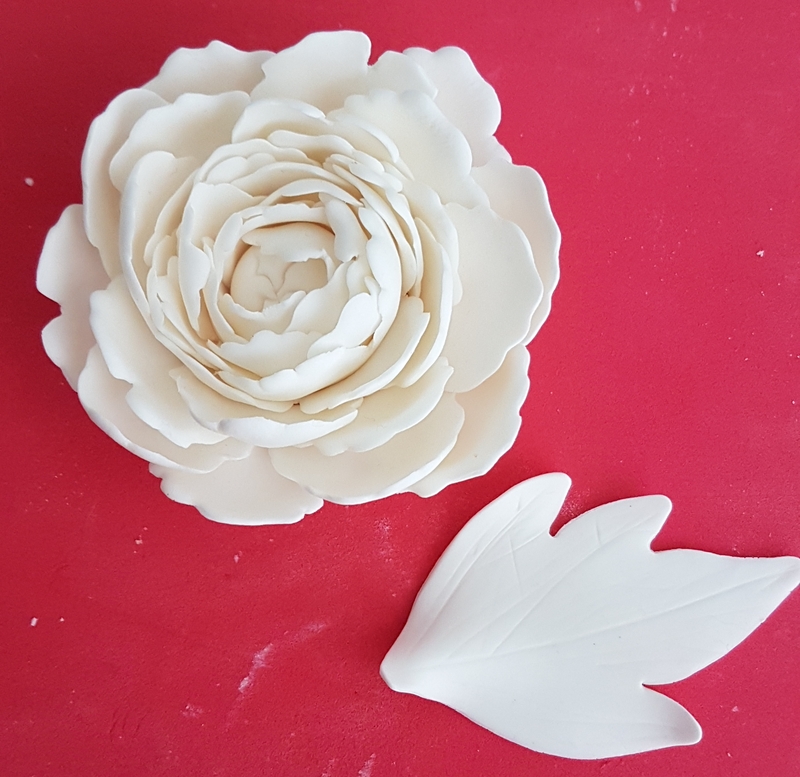 The difference between the Easiest Peony Ever cutter and those of the rose and carnation is that this one also includes a leaf cutter. It saves having to buy a separate leaf cutter to complete your arrangement, which is a bonus. I had always thought peonies would be incredibly hard to make. Well this cutter set makes them so simple. Anyway, on to the tutorial. 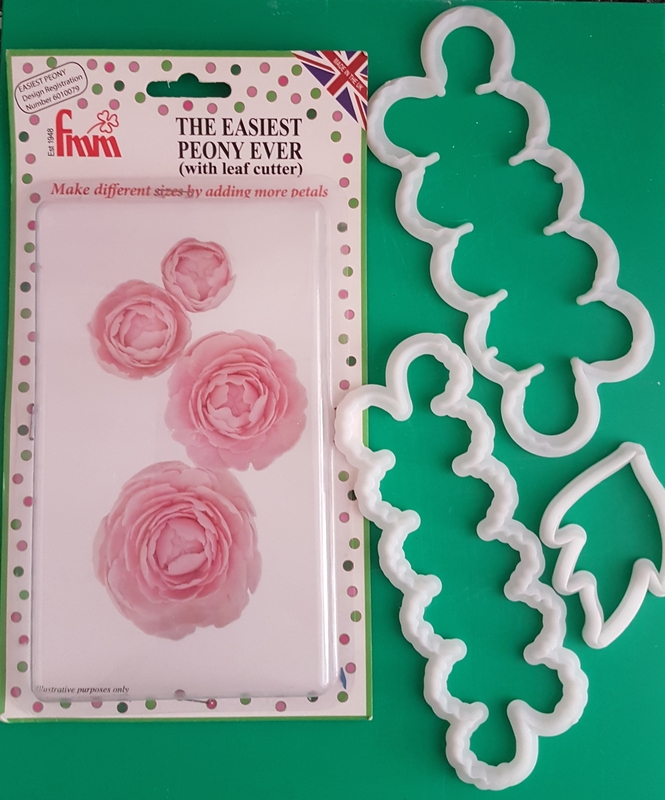 FMM made a brilliant video to demonstrate how to use the Easiest Peony Ever cutter set and you can watch that HERE. It is definitely worth watching and it s how I learnt how to use it myself. 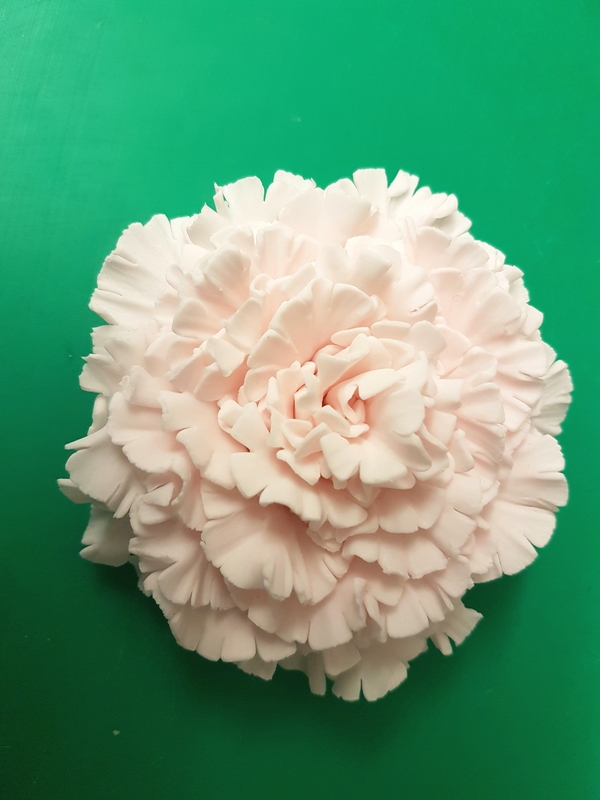 It is best to use modelling paste to make your peony. 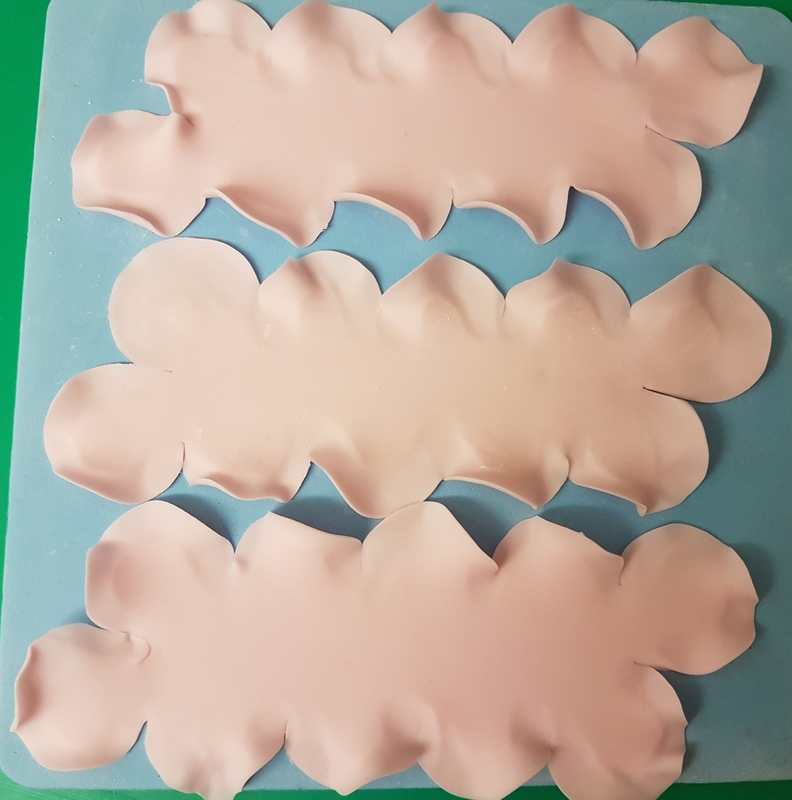 Normal sugarpaste or fondant just won’t hold the shape as well as modelling paste. 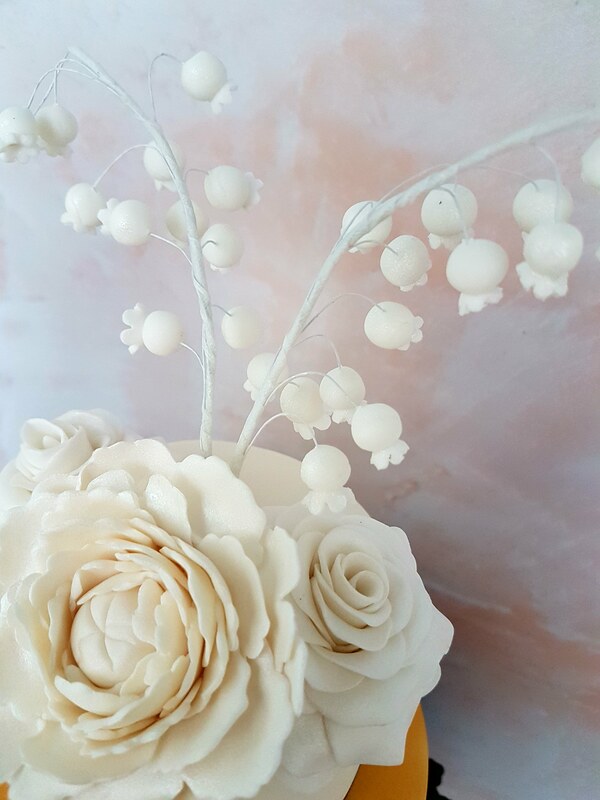 You can make your own modelling paste by adding a bit of Tylo powder to normal sugarpaste, or by mixing equal amounts of sugarpaste and flower paste. I find it more economical to add tylo powder to sugarpaste. (You need about half a teaspoon for 250g of sugarpaste). Lightly dust your workboard with your cornflour pouch so the modelling paste doesn’t stick. 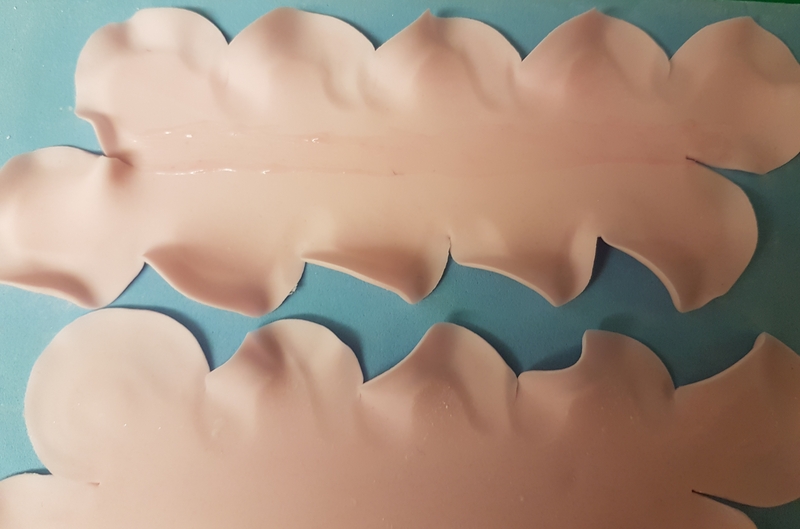 Start by rolling your modelling paste to around 2mm thickness and then use the smaller of the two petal cutters to cut out two sets of petals. I like to leave these to one side on the foam pad for a few minutes while I do the next step, as it helps if they dry out very slightly. 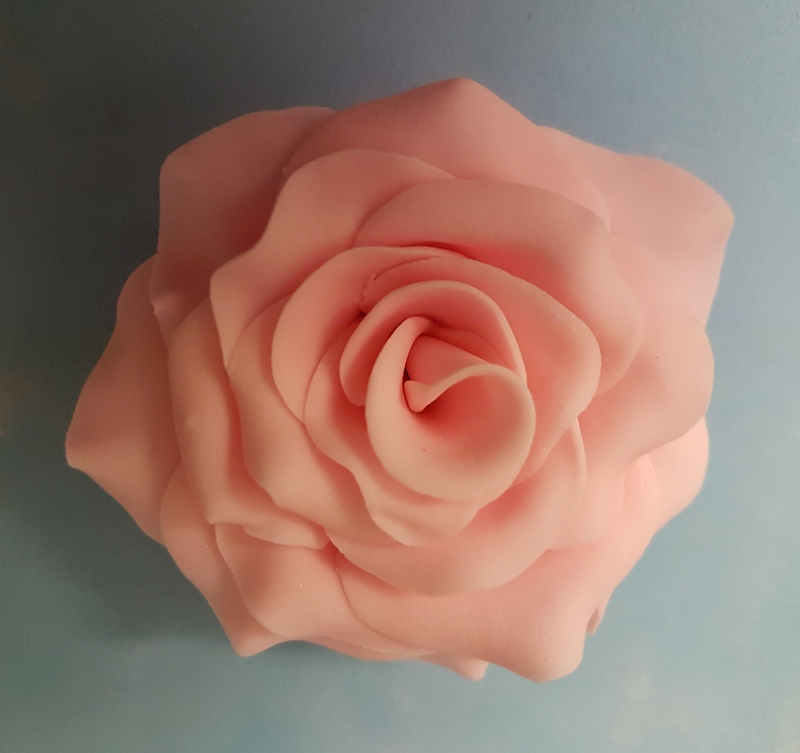 Take a small amount of modelling paste, roll it into a ball, and place it into one of the end petals on the small petal cutter. It needs to fit perfectly inside the petal shape so that the petals will wrap around it correctly afterwards. 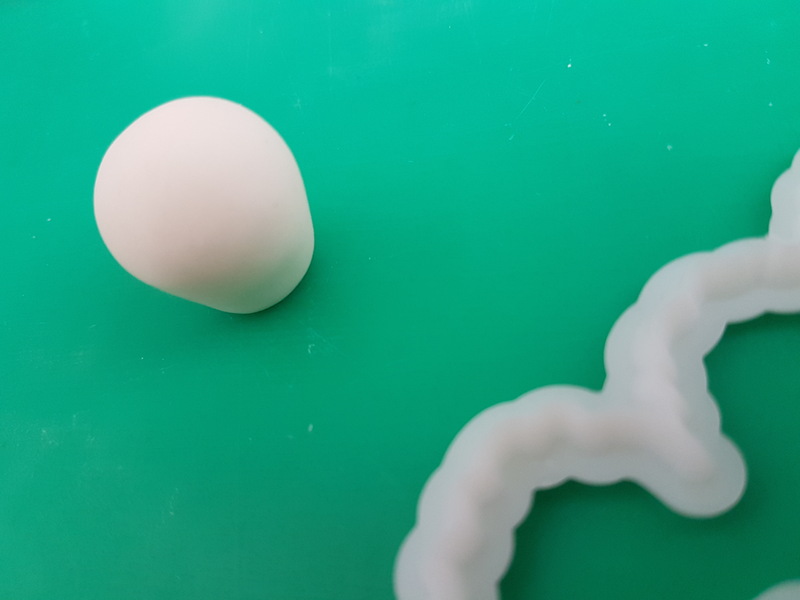 Place the ball on to your work board and using the sides of your hands, roll the bottom of it so that it narrows and is able to stand without moving. Again using the small petal cutter, use the edge to press 3 lines diagonally across the top. This is the centre of your peony. Now back to the petals. 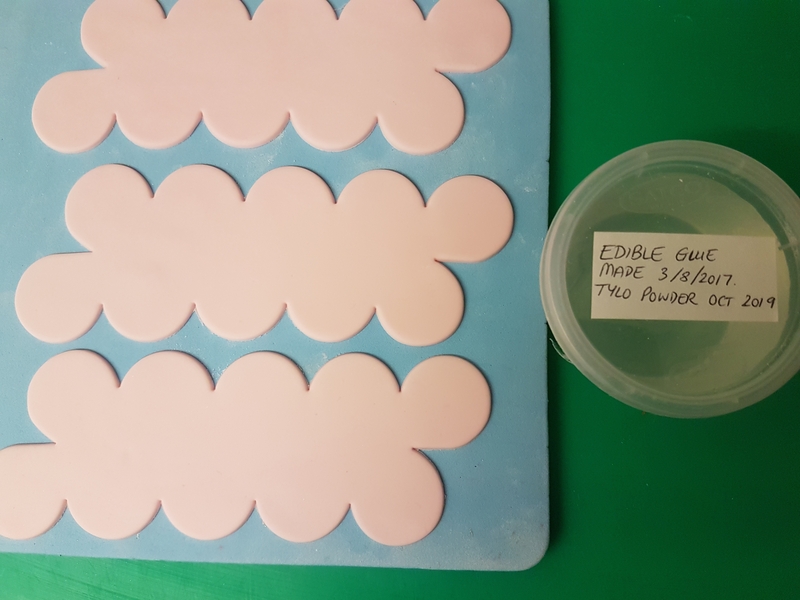 Keeping them on the foam pad, use the edge of the rolling pin half on the pad and half on the paste, and firmly go around the outside of the petal shapes to thin and slightly shape them. When you have gone all the way around the whole shape, it is time to cup the petals. To do this, lay the petals horizontally on the foam pad. 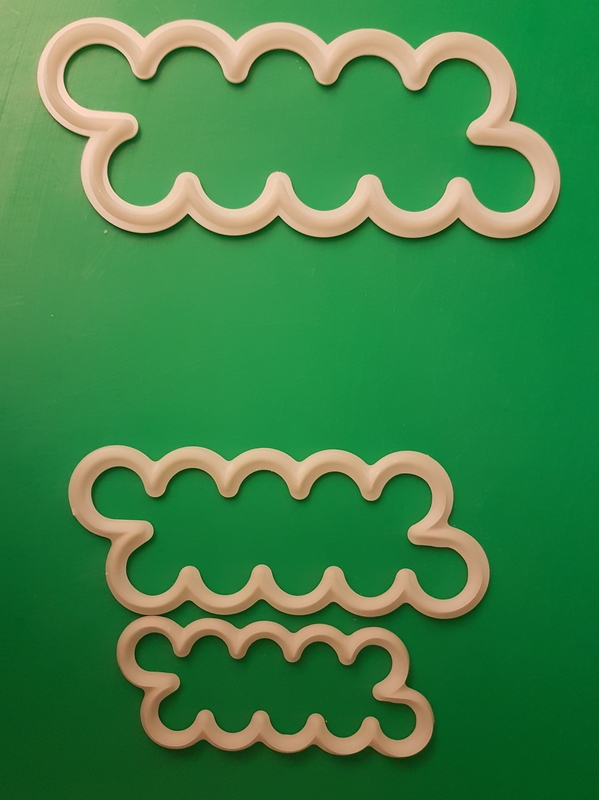 Place the end of the rolling pin on the paste at the top of the first petal shape, press and then drag the rolling pin down to the middle. You will see the petal then forms a cup shape. Repeat for each petal along the top of the strip. The petals will all be cupped and curling upwards. Now this bit is so so important! Flip the strip completely over so that the cupped petals are now on the bottom and facing the foam pad. They MUST be facing the foam pad or else they won’t wrap snugly around the centre bud. Hopefully you can see what I mean on the above picture. The top petals now need to be cupped while the bottom ones are already cupped but facing the pad, so they look like little hills. Use exactly the same process to cup the top row now, pressing the end of the rolling pin into each petal and dragging it down to the middle. Now the top row should be curling upwards while the bottom row is curled towards the pad. Brush a line of edible glue across the middle of the strip and about half way into each of the top petals, then gently fold it in half bringing the bottom petals up to the top. Press gently along the fold to make sure it has stuck. All petals now will be facing the same way, ie all cupped in the same direction. Brush another line of edible glue along the bottom half of the folded strip. Now it is time to start forming your peony. 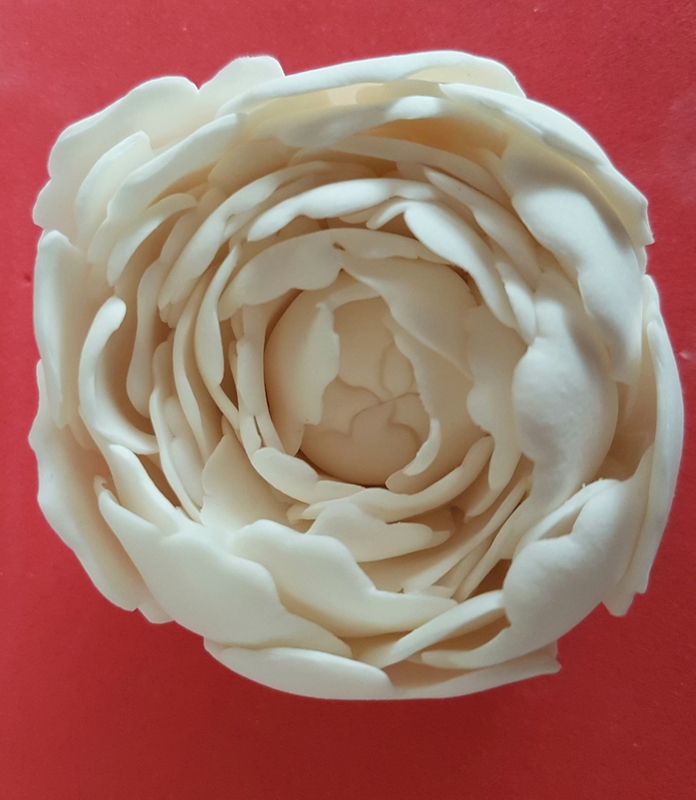 Holding your ready made peony centre (bud) steady on the workboard, position the end of the petal strip against it so that the first petals start to enclose it inside their cupped shape. Wrap the whole of the strip around and press gently to make sure it sticks well. You should be able to see the lines you made on the centre bud so that they look like petals still waiting to open. Repeat the whole process of cupping petals for the second strip you have already cut out. When you have folded the strip in half, brush a line of edible glue along the bottom half. Place the first petal of this strip just overlapping the last petal you finished the previous layer with. Wrap around as before. You see your flower really starting to take shape now. The final 2 layers of petals are made using the bigger cutter of the two in the set. 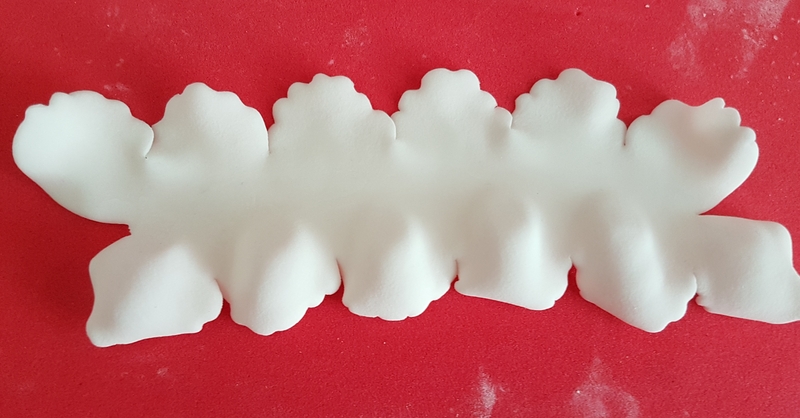 If you are using coloured modelling paste, you might want to use a slightly lighter shade for the last 2 layers. 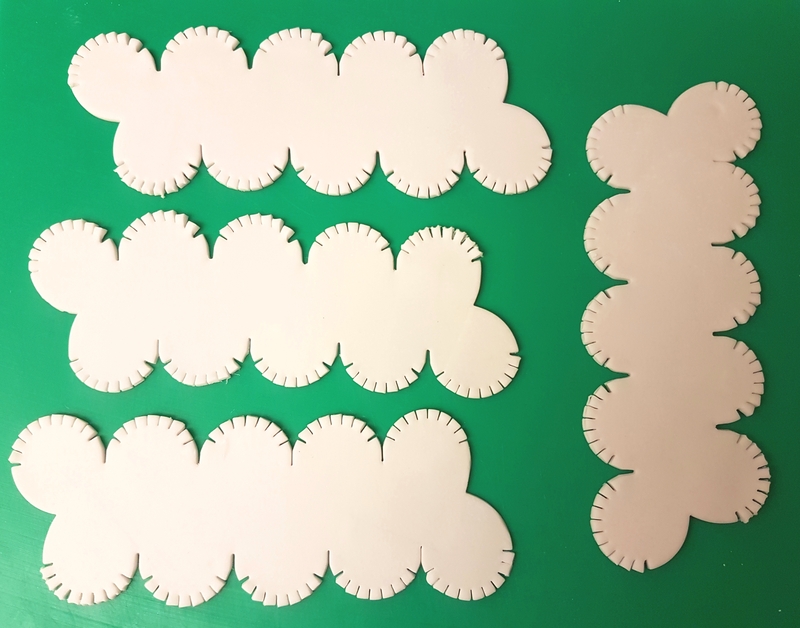 Roll your modelling paste to around 2mm and use the larger cutter to cut out two more sets of petals. Place these on to your foam pad and leave for a few minutes to dry slightly. 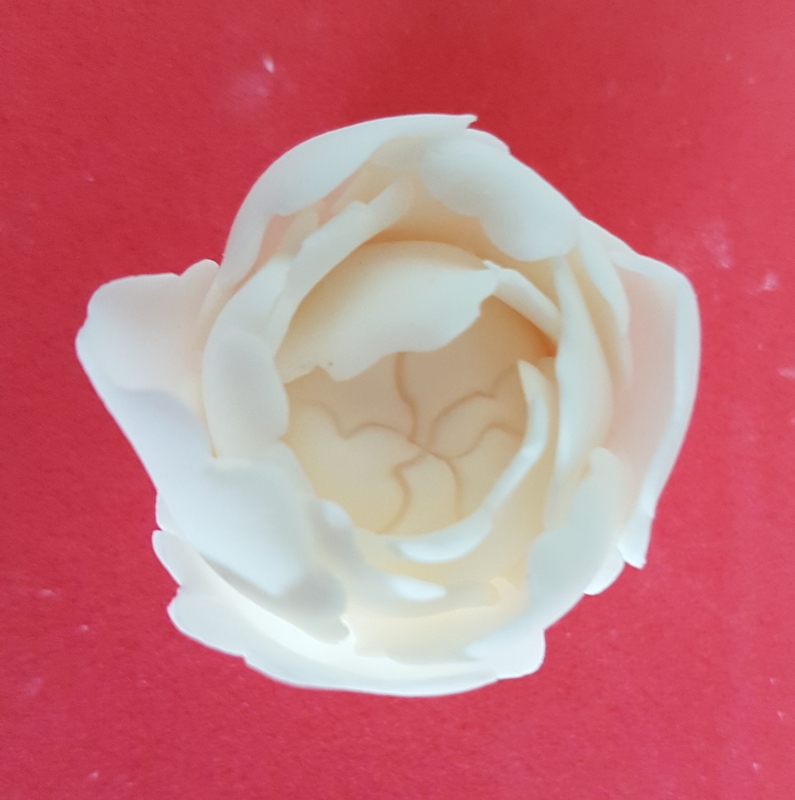 You then follow the exact process that you did for the smaller petals… thin the edges, cup the top petals, flip over, cup the remaining row and fold in half. Brush a line of glue along the bottom of one of the folded strips but this time don’t brush up into the petals. You want these ones to open slightly. Find the last petal that you wrapped around your peony and position the first petal of this larger strip to just overlap it, making sure again that the petals will cup around the peony, not away from it. Wrap this layer around your peony. You will see that these petals are a bit bigger than the previous 2 layers. If you want, you can stop at this stage but to make a truly beautiful peony you need to repeat the process with the final strip of petals. Wrap the final layer starting from where the previous layer finished. Now for the fun part. You were probably wondering why you needed a cupcake case. Well you need it for this part. Place your peony into the cupcake case. This will help to keep it in shape while it dries. You can keep it looking quite closed as in the photo above if you like. It looks lovely like that. Or you can open it out a bit to make it look like it is in full bloom. 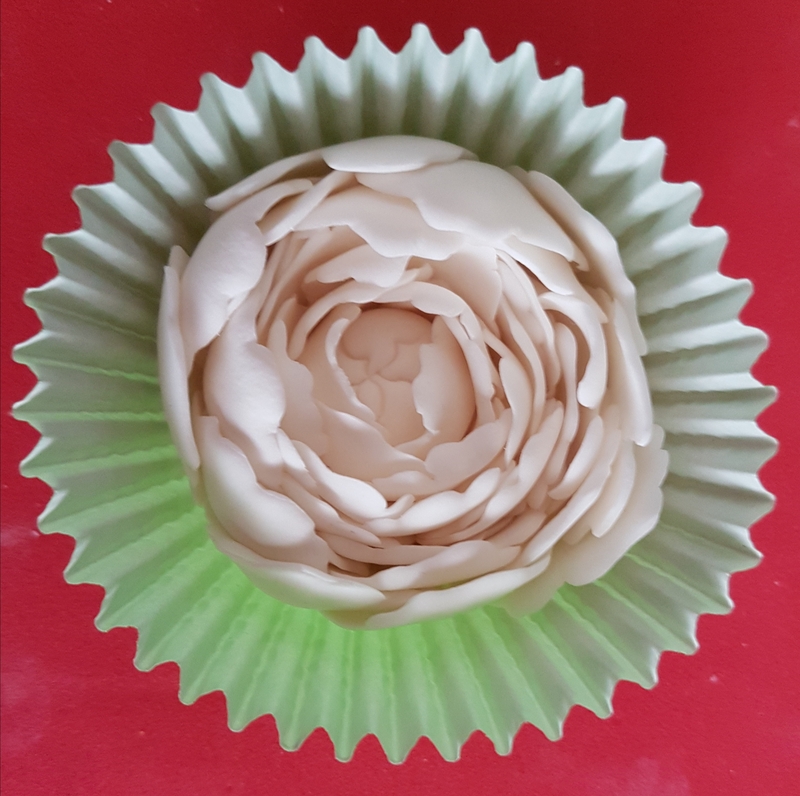 To open it out, gently pull the sides of the cupcake case to make it wider, and using a dry brush carefully start to spread out the petals until they are as open as you prefer. Your peony now just needs to be left in the case overnight to dry. Meanwhile, you can make a leaf if needed. 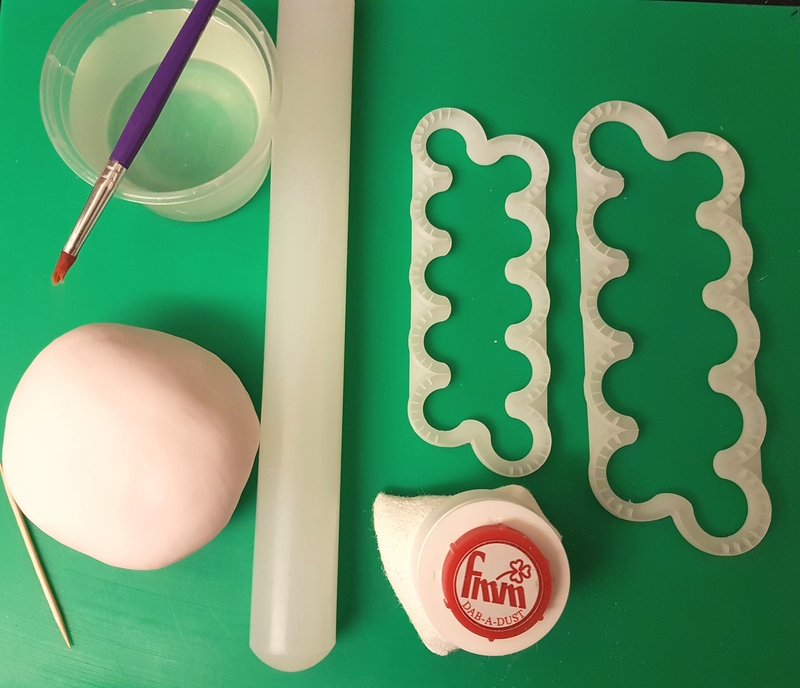 Roll your modelling paste to 2mm thickness and use the leaf cutter to cut out a leaf shape. 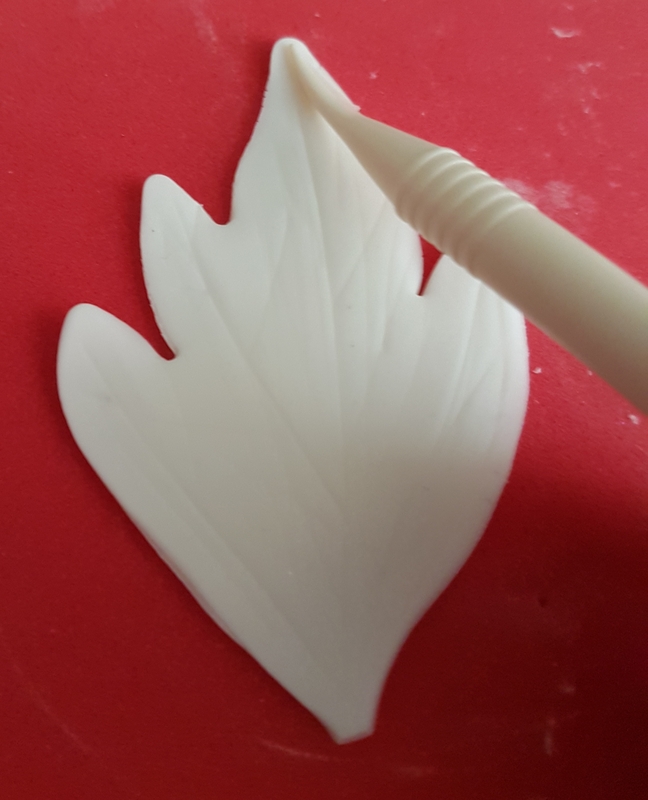 Using your veining tool or a cocktail stick, mark some vein lines on the leaf. Wasn’t that easy? You can let the leaf dry flat on your foam pad or give it a bit of shape by rolling up some kitchen roll or cling film and draping the leaf over it to create a curved shape. Leave to dry overnight. You now have a beautiful peony and leaf ready to put on your cake. If you like them to look matt, leave them as they are. If you want to add a bit of colour or shine to them you can gently dust them with a petal or lustre dust of your choice. I added a light dusting of pearl dust to mine as I wanted it to glisten slightly but with no colour. 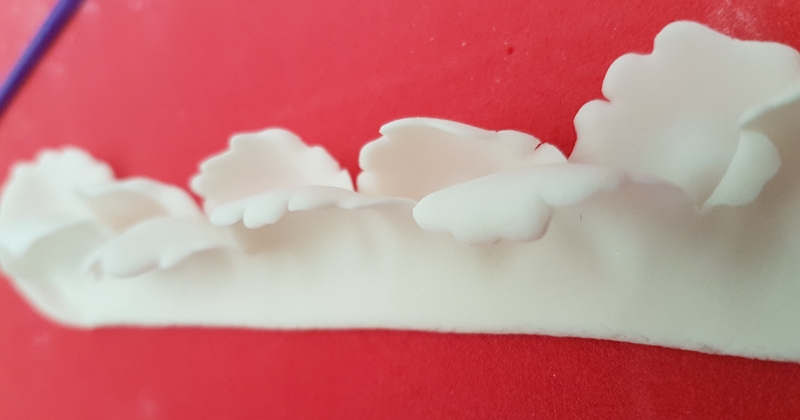 You can attach them to your cake with royal icing or edible glue. 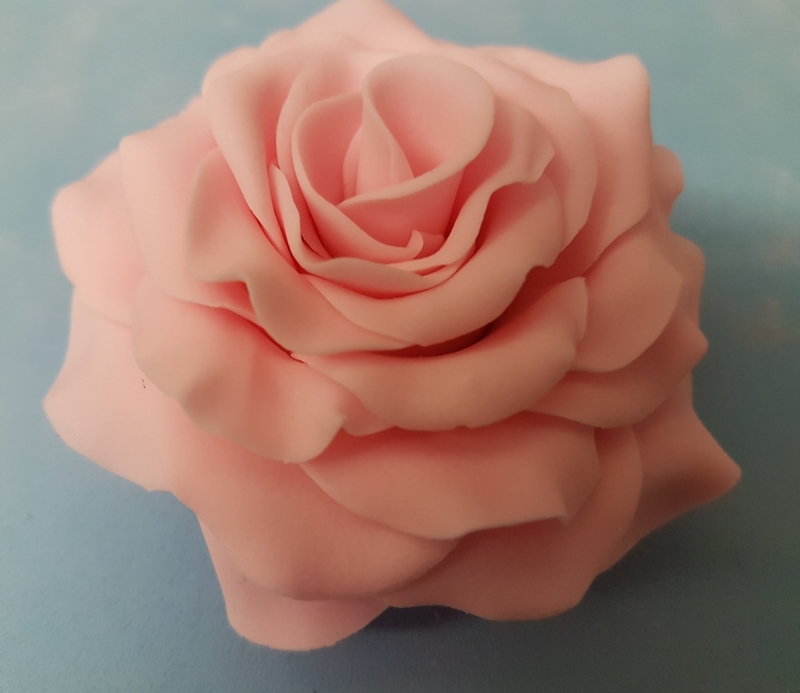 I placed a small ball of the same colour fondant to the top of my cake and then stuck the flowers around the edge of it so they were at a bit of an angle. If you would like to make some peonies yourself, CLICK HERE to go their link on the FMM website. I would love to see your creations so show me your results when you have made them. 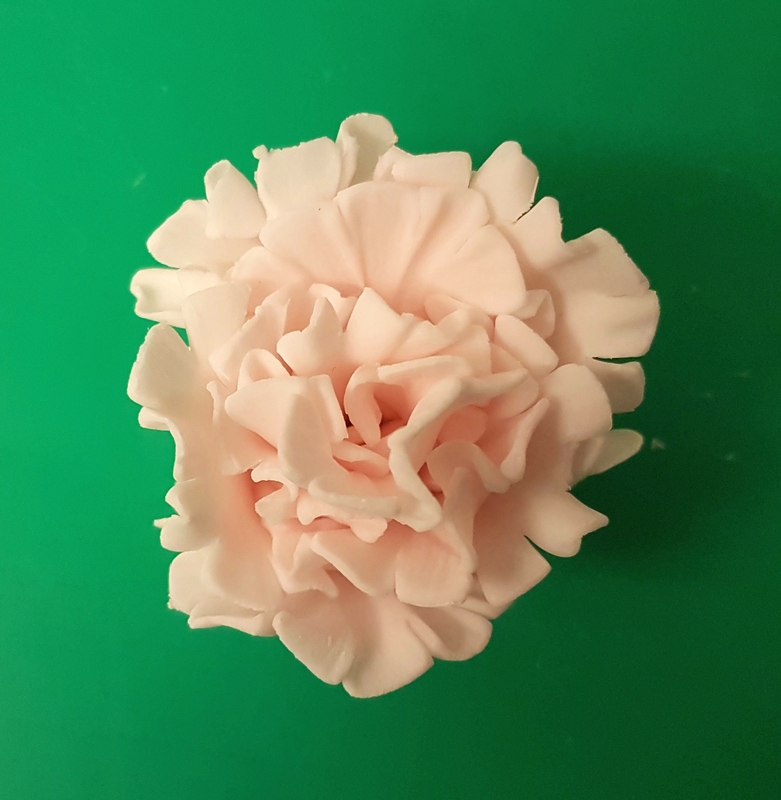 I recently wrote a blog tutorial on how I use the fantastic FMM Easiest Rose Ever cutters (CLICK HERE if you want to read that one), and I mentioned that FMM do other flowers in this range, including carnations. 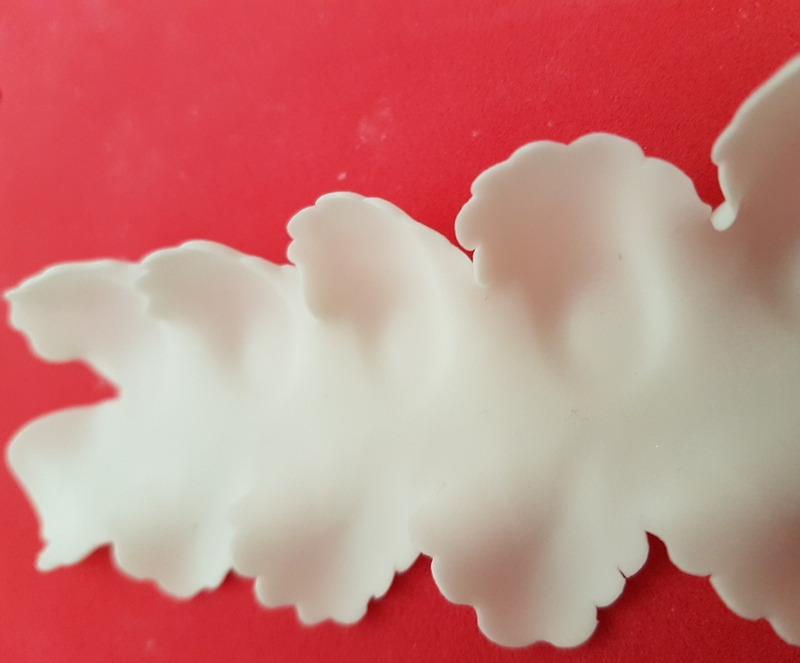 I thought I would show you how easy it is to make pretty carnations with the FMM Easiest Carnation Ever cutter set. 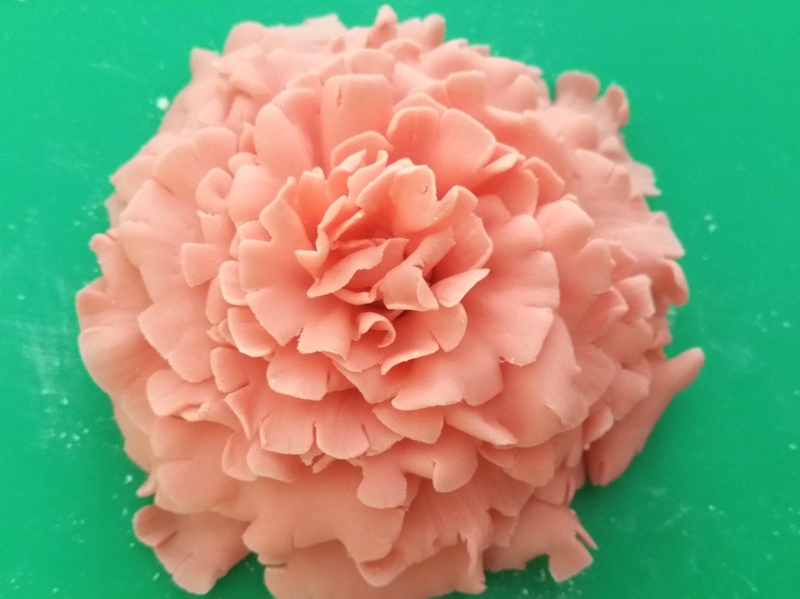 I was really pleased with it at the time, but now I like to dust the edges with a little bit of lustre dust as, if you look at a real carnation, the edges are often slightly darker. 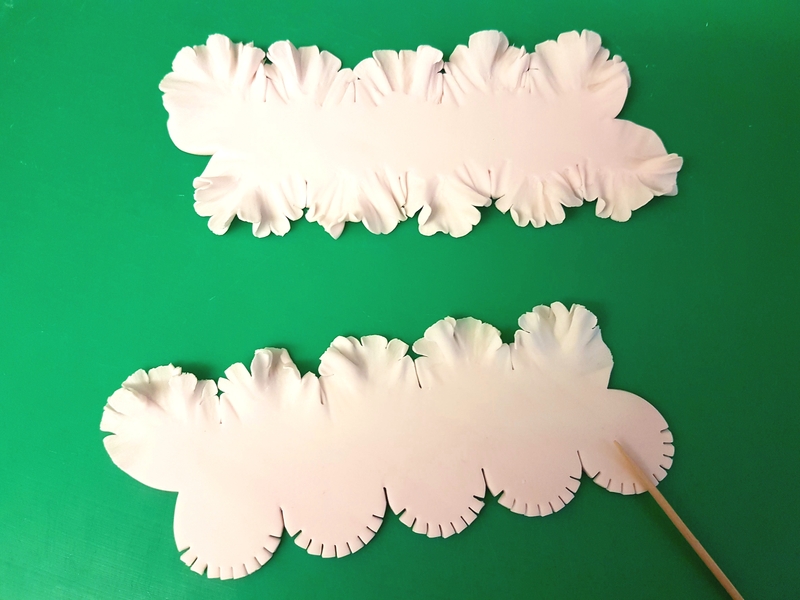 The FMM Easiest Carnation Ever cutter set comes with 2 sizes of cutters, allowing you to make endless different sizes of carnations. 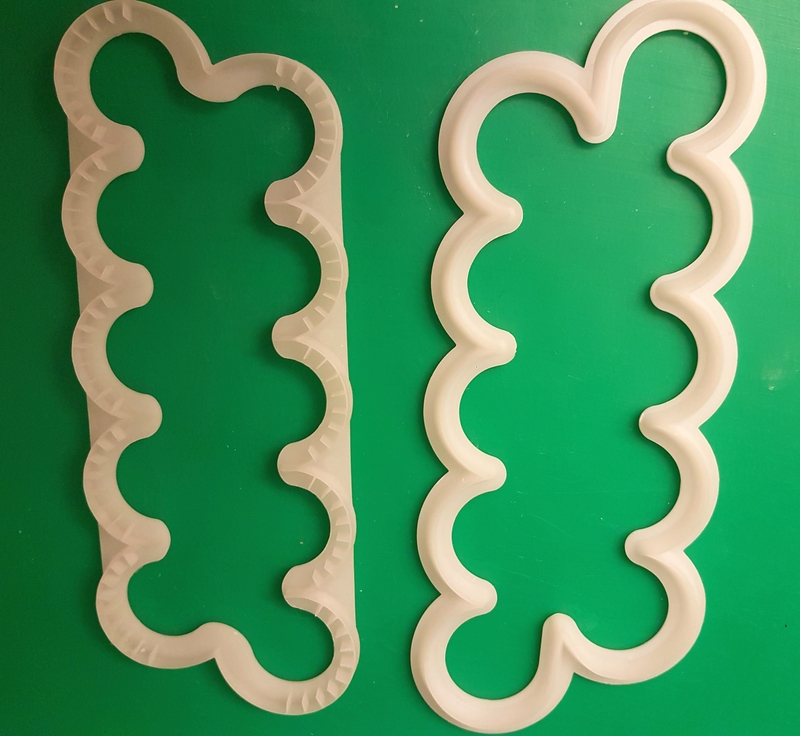 You will see in the picture below that the difference between this cutter (on the left) and the rose one (on the right) is that the carnation one has lots of tiny lines along the edges. These tiny lines are what helps to give the beautiful frill detail at the edges of the petals. 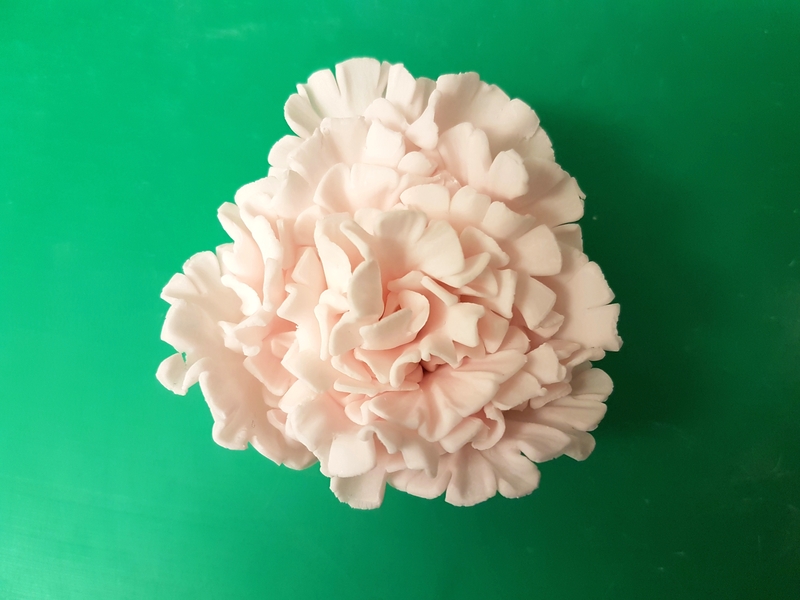 To make your carnations, you will need the cutter set (obviously), modelling paste in the colour of your choice, a cornflour pouch, a cocktail stick or frilling tool, a small rolling pin, edible glue or cooled boiled water, and a clean paintbrush. 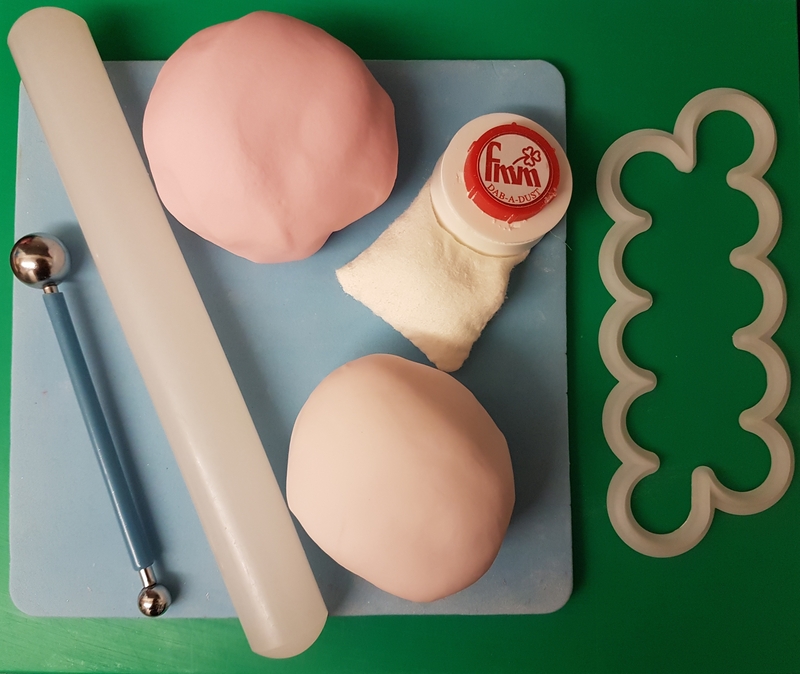 You can buy modelling paste ready made, or make your own by kneading a tiny bit of Tylo Powder into normal sugarpaste, or knead together a 50/50 mix of flowerpaste and sugarpaste. I use the Tylo Powder method as it is more economical. Dust your work surface with cornflour. 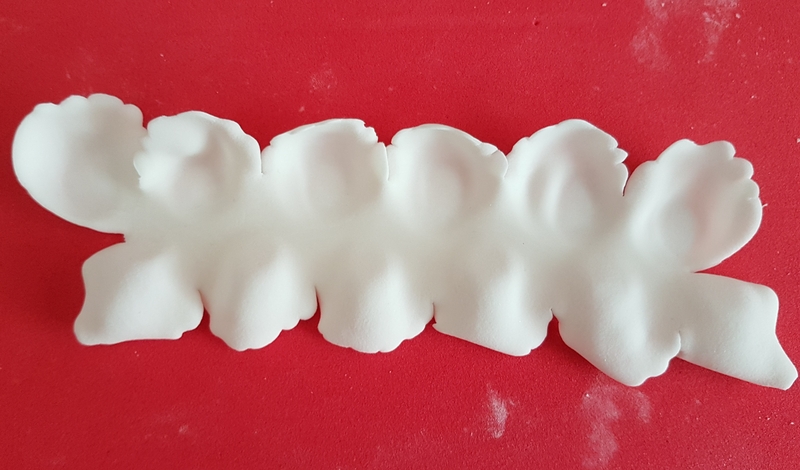 Roll the modelling paste out to around 1mm thickness. Press the cutter firmly down on to the paste, and move it around slightly while still pressing down. This will ensure a crisp clean cut. As there are so many tiny lines on this cutter, the paste will stay in the cutter when you lift it up. This is normal so don’t panic. 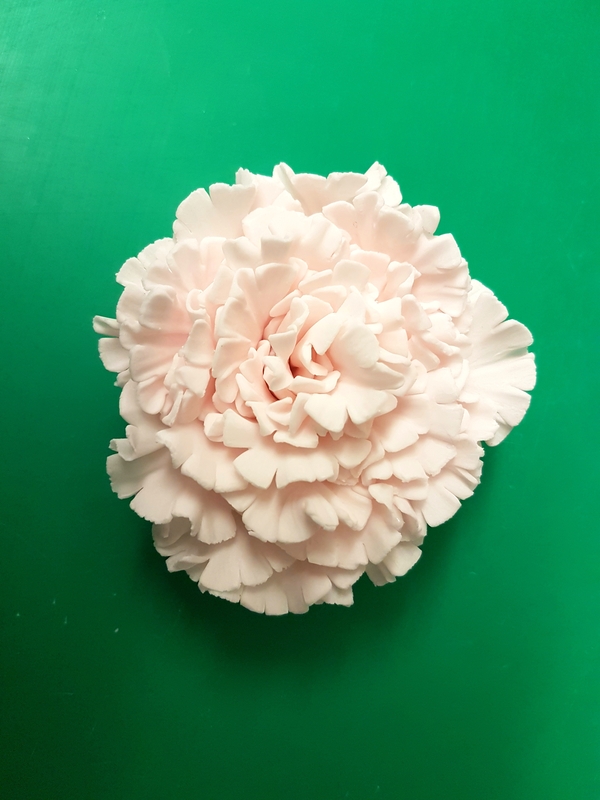 Just gently use your finger to push each petal shape out on to your work surface. To make a full bloom carnation you will need to cut out 3 lots of petals. A slightly smaller one needs 2 lots, and a spray carnation or bud just needs 1. To get the best results you need to leave the cut out shapes for around 10 minutes so that they dry slightly. This just makes them easier to work with and they will hold their shape better when forming the carnations. Now for the fun part… frilling. If you look at a real carnation, the petal edges are very frilly, and this is where those tiny cut edges of the cutter really come into play. Watch the video again to really understand the technique needed here. It is really simple to do. Lie your frilling tool or cocktail stick on to the edge of the petal, press it firmly down and at the same time roll it in small movements along the cut edges. Keep moving it in between each and every little cut part of the petal edge and roll each little section. This will make it really ruffled. the more frilly it looks, the better. Occasionally you might find little tiny bits tear as they become so thin and delicate. Don’t worry, you really won’t notice in the end result. Repeat this for all of the shapes you have cut out. 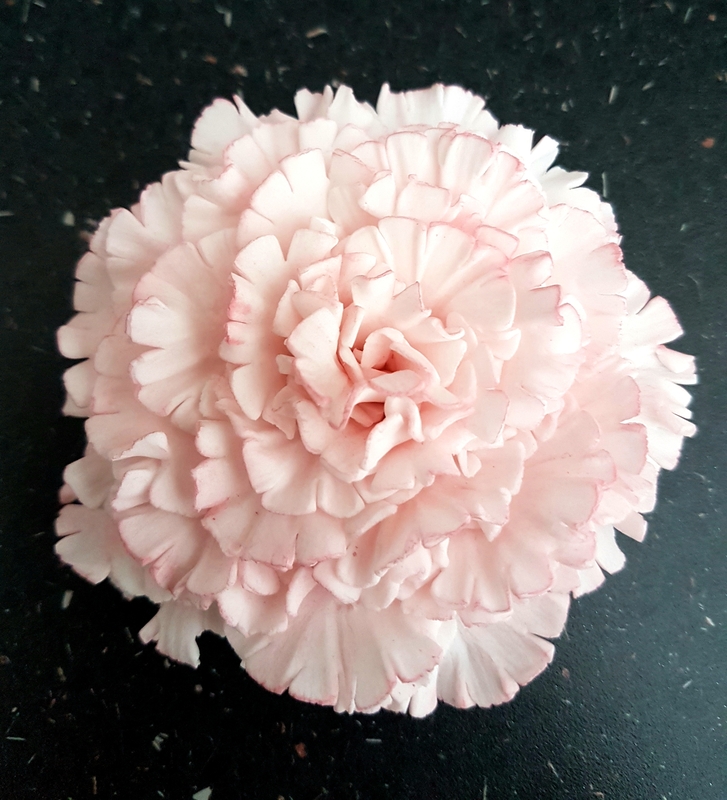 Stupidly I have lost the photo of the next stage, but I have a photo from a carnation I made a long time ago so please excuse the change of colour. It is just so you can see what I mean for the next part. 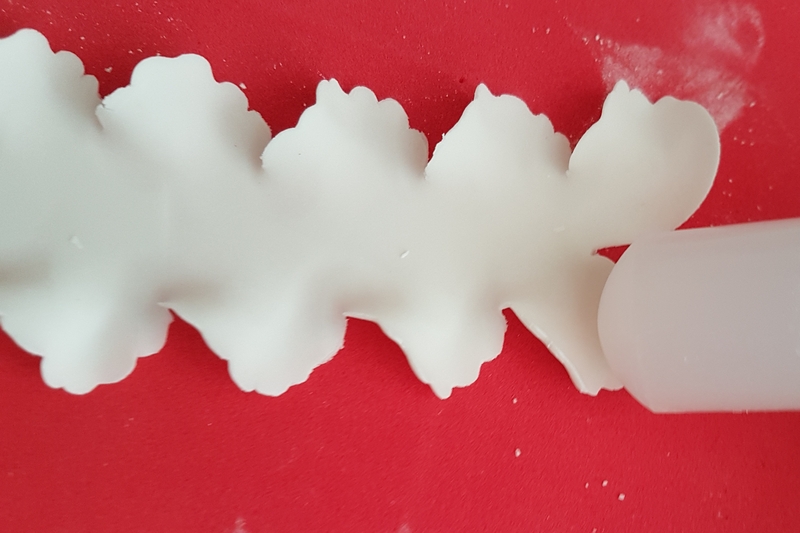 When you have frilled all around the edges, brush a line of edible glue or water along the centre lengthways, and then carefully fold it in half. Repeat this step with all of the shapes you have frilled, so you have your layers of petals ready to use. Brush another line of edible glue or water along the bottom half (the straight part) and very carefully start to roll tightly from one of the sides. When you have rolled about halfway along, gently stand the carnation up and continue to roll the remainder while it is standing up. This makes it easier and lets the petals move into a better shape. You now have the first size of carnation, perfect for a bud or a little spray carnation. If you want it bigger, just wrap another layer of petals around, starting from where the first layer ended. If the petal edges are looking a bit too tight, just separate them gently using a dry brush. You don’t need to shape them as the frilling has done that already. And now you have the next size up. One more layer of petals after this makes a lovely large full bloom carnation. I went one further though with this one and made a huge carnation with one more layer of petals. When you have the desired size, leave it to one side to dry completely. You can either leave them just as they are, as they look beautiful already, or you can dust the very edges with lustre dust. To do this, dip a dry paintbrush into the coloured dust of your choice, dab off any excess on to a piece of kitchen roll, and using small movements carefully brush the edges. You can repeat this as much as you want to build up the intensity of the colour, but make sure you keep dabbing excess powder off the brush. It is easy to build up colour gradually but not easy to tone it down if you go straight in with a brush loaded with colour. If you look closely at the carnation in the main picture you will see I have dusted the edges just slightly darker. On the one above, I gently dusted the whole carnations with a pale lustre dust so they had a beautiful soft sheen, and then dusted the edges with a slightly darker shade. On the one below the bride wanted pure white carnations so I didn’t dust them at all. So now you can easily make stunning roses and beautiful carnations. Wait until you see the other cutters in this range: the Peony and the Ranunculus! They are even easier still, as you will see in my next tutorial coming soon. I absolutely love cake decorating, and I particularly love anything that makes the process quicker and easier. 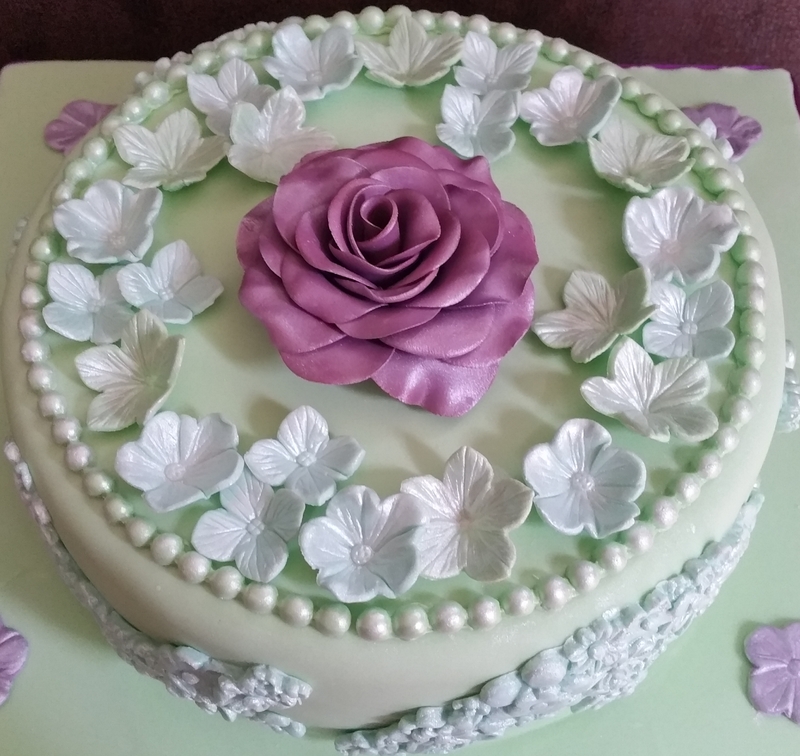 Cakes with flowers on always look so beautiful but they can take soooooooooooooooo long to make, especially if there are lots of flowers on them. 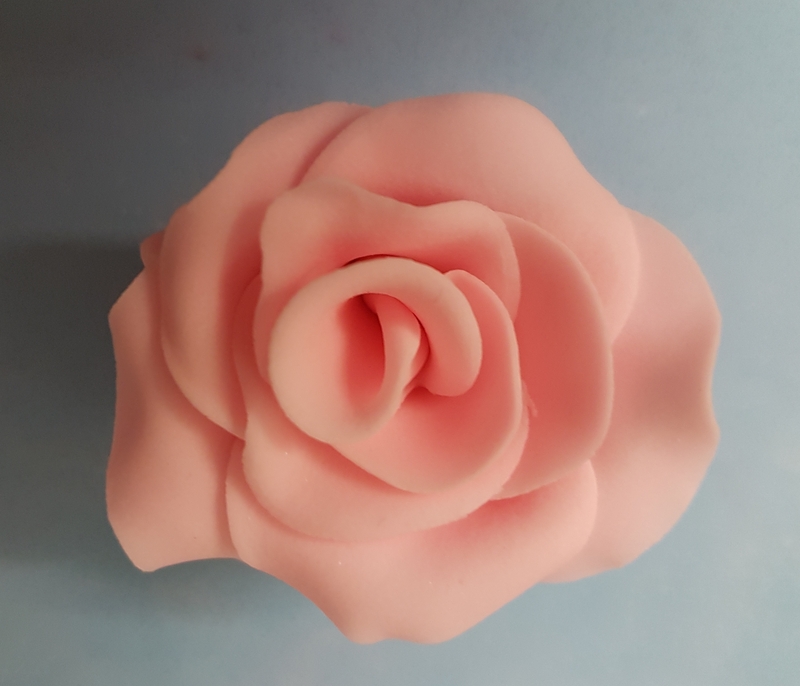 I’ve tried many methods of making roses before. The wired method looks amazing but I just don’t have the patience for wired flowers. 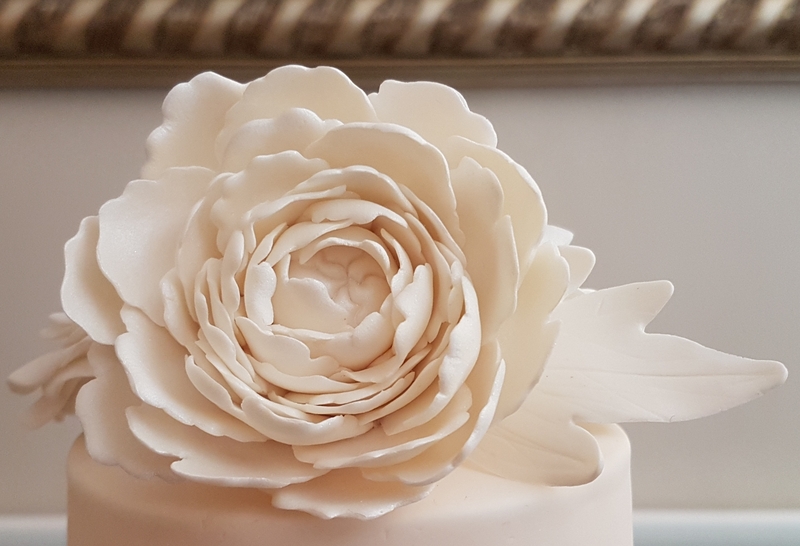 I’ve tried the 5 petal rose cutters before… absolute disaster! I just can’t make those things work! 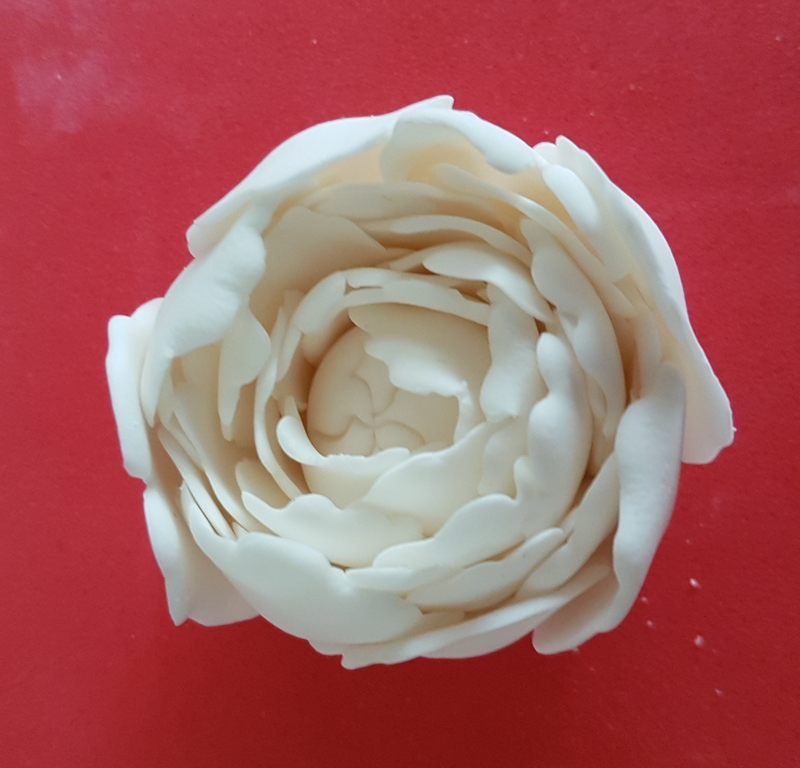 I’ve tried the method of making individual petals, smoothing their edges in a ziplock bag before sticking them on the rose… too much faffing around and inconsistent results for me. When I heard there was a cutter from FMM called The Easiest Rose Ever, I had to have it! Now it is all I use and I love it. One rose literally takes minutes to make and I love the look of them. 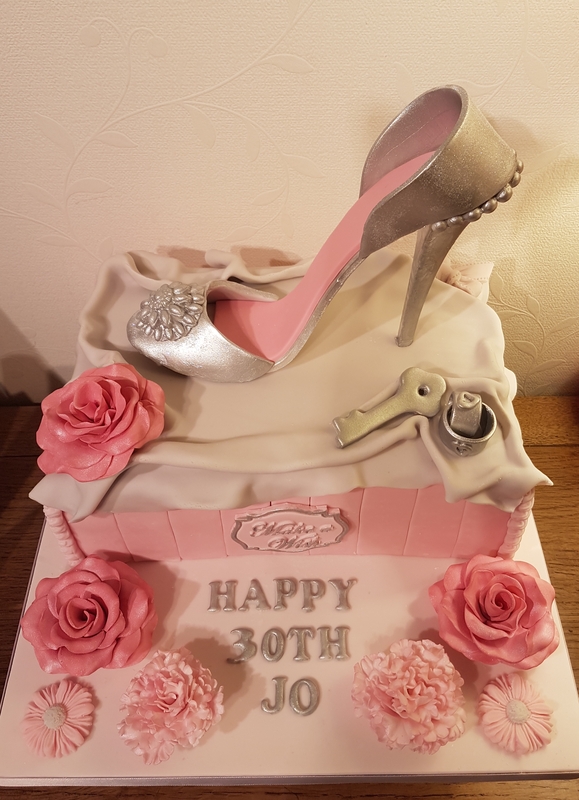 I used this cutter for the roses on the cake in the main image. A few people have told me though that they are struggling to use this cutter, so I thought I would show you how I do it. I watched this YouTube video before my first attempt. Have a look at it before you read on, or go back to it if my instructions aren’t clear enough. It helped me brilliantly. 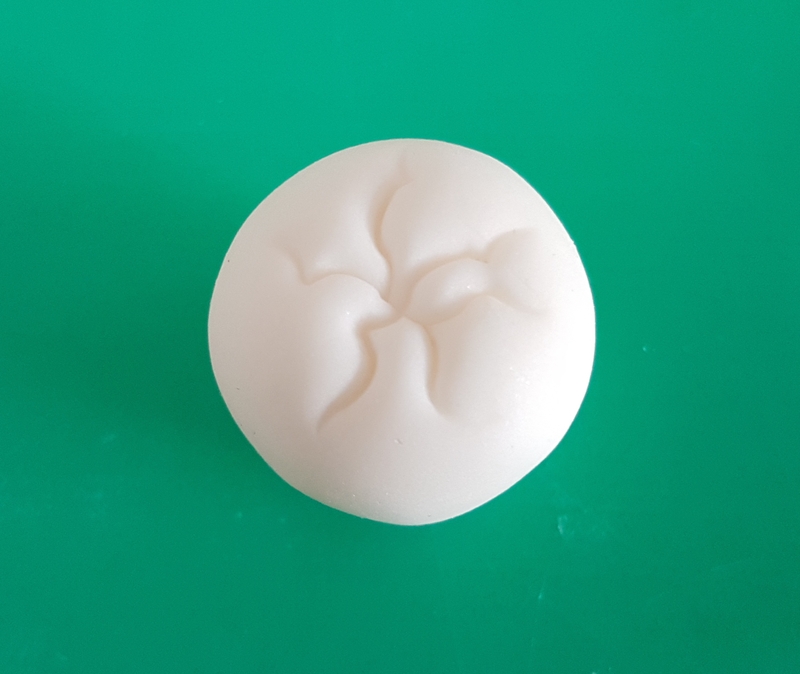 You can buy The Easiest Rose Cutter from most cake decorating stores or direct from FMM, who make it. 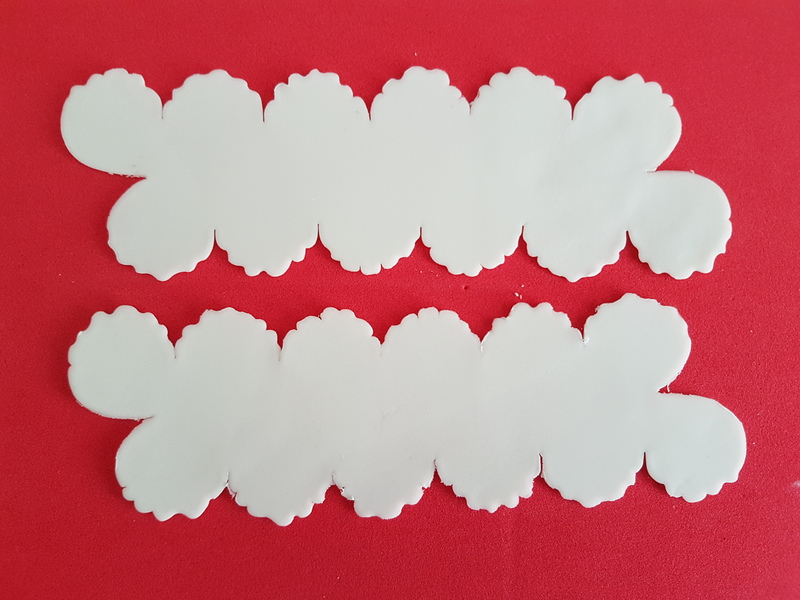 It is also available in a Smaller set which has 2 smaller cutters… perfect for cupcake toppers or small cakes. The original sized one though makes different sized roses too. I’ll put links up at the end for you to buy the cutters. 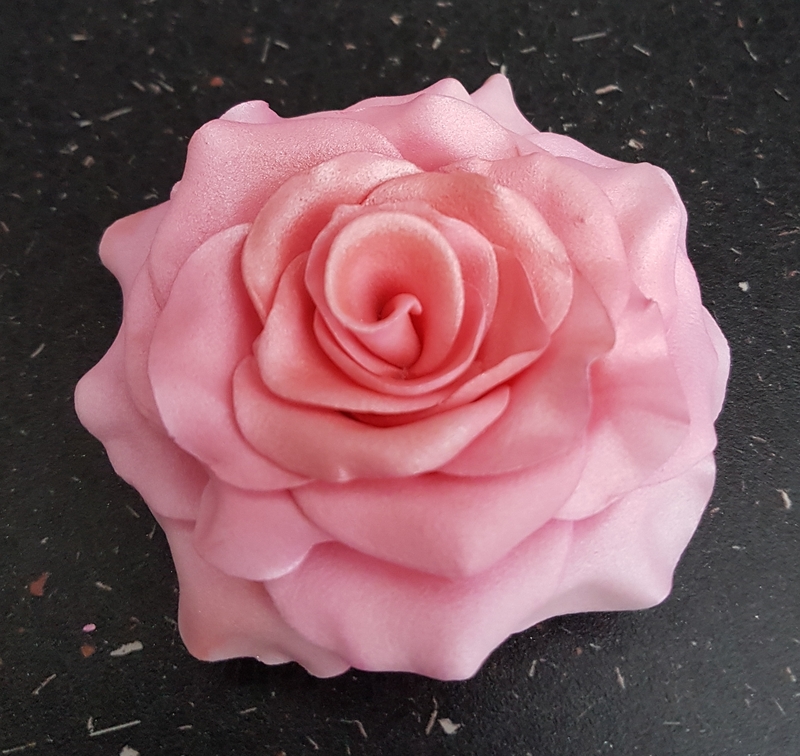 To make a rose you will need the cutter, flower paste in whichever colour you prefer (or I use normal sugarpaste with a little bit of tylo powder added), a small rolling pin, edible glue, a workboard or mat, a foam pad, and a cornflour pouch or large soft brush to use to dust a bit of cornflour. 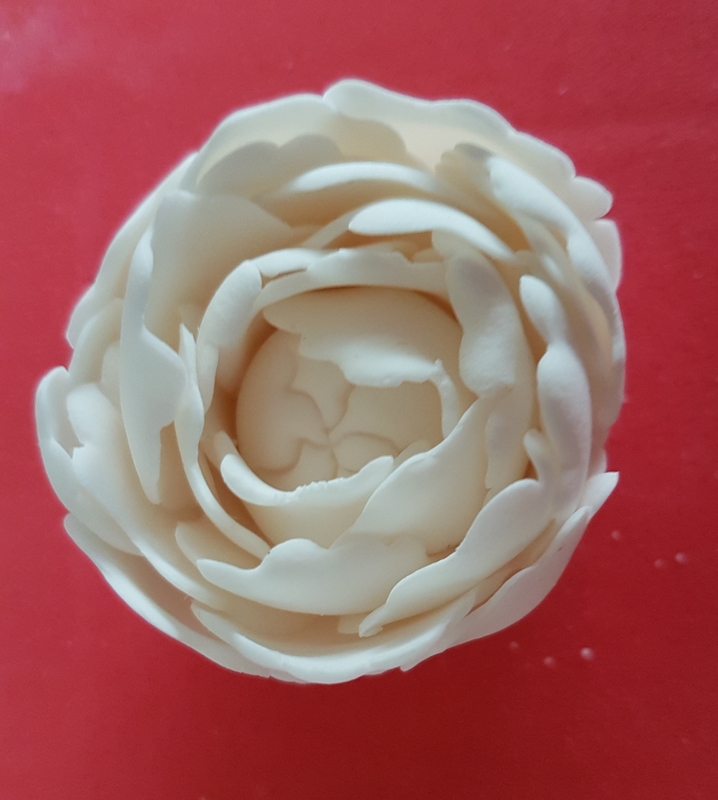 In the YouTube video it says to use the end of your small rolling pin to thin the petal edges. I actually find it much easier to use a large ball tool, but either method is fine. Just see which works best for you. Dust your board or mat with a light dusting of cornflour and roll out your flower paste to about 1mm thickness. Press your cutter firmly down on to the paste and give it a little shiggle around to make sure it has cut through cleanly. Gently press the shape out from the cutter and cut out another 2 shapes. These 3 shapes will make one full rose. Place them on to the foam pad. This bit is vital…. leave the shapes to dry slightly for 5 to 10 minutes. They hold their shape much better if the paste is left for a few minutes. Ignore the glue in the picture below, you don’t need that yet. After this time has passed, we can thin the edges of the petals. Very lightly dust the shapes with cornflour. 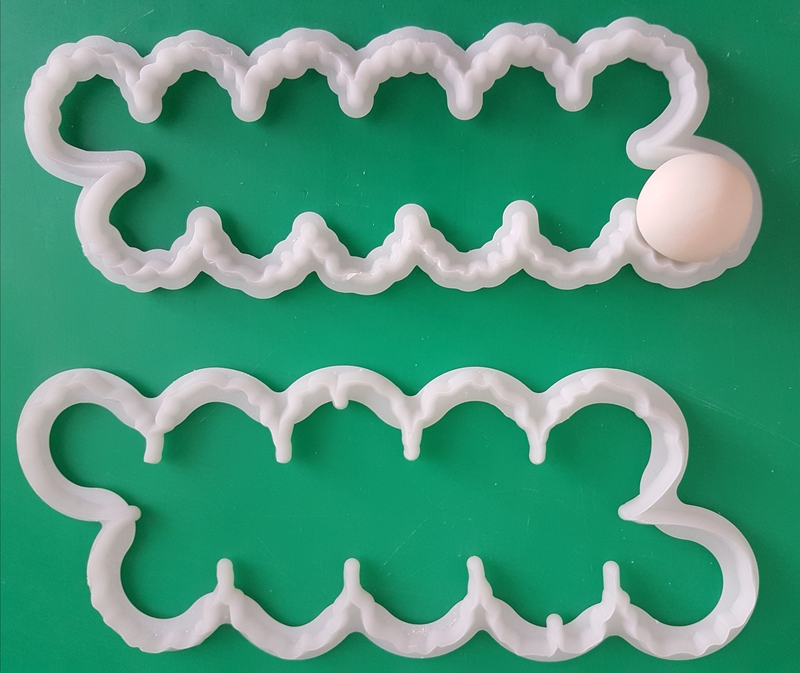 Position the ball tool or tip of the rolling pin so that it is half on the edge of the paste and half on the foam pad. Go all around the edge of the petals pressing down very firmly. As you follow the shape around you will see that the edges start to go really thin and curl into gentle waves. This is exactly what you want it to do. 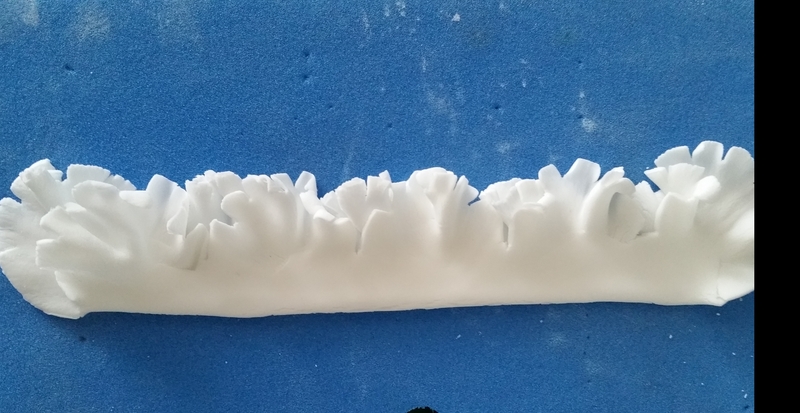 If you hadn’t let it dry for a few minutes after cutting out the shapes, these waves would just flop back down. As you let it dry slightly though, they will stay. Repeat for all 3 shapes. 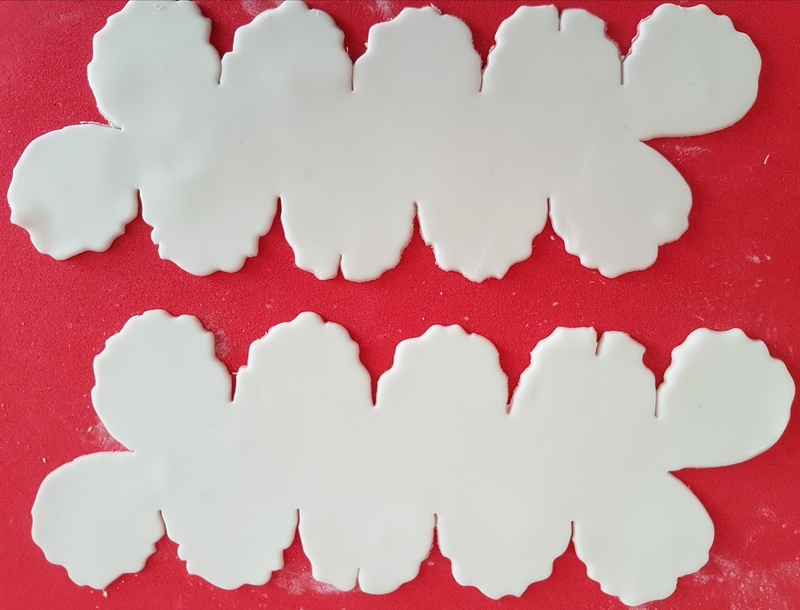 Brush a line of edible glue across the middle of each cutout shape. You can just see the glue on the picture below so you know where I mean. Carefully fold the shape in half lengthways so that the bottom petals lie alongside the top petals. Keep the folded edge nice and straight. Repeat for all 3. 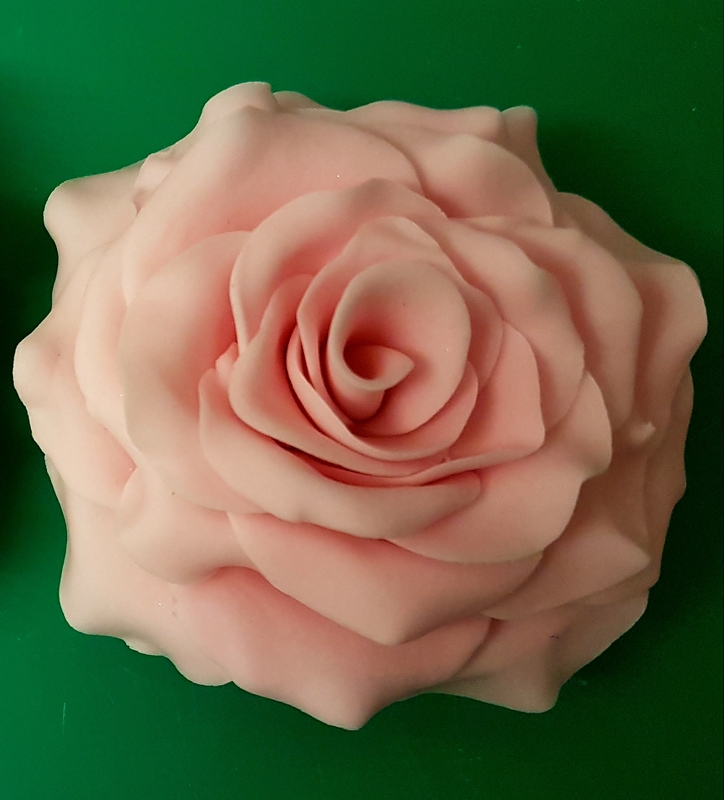 Now for the fun bit… making the rose. Brush a line of glue just above the folded edge, making sure you don’t go on to the rounded parts of the petals. You can see my glue line in the picture below. Keeping the petals lying down, start rolling from one side as tightly as you can. When you are about a quarter of the way along, carefully stand it up and continue rolling in an upright position until you reach the end. You might need a tiny bit of glue to secure the last petal on to the roll. You have now made a small rose. I now use a dry soft brush to gently tease the petals slightly apart. If that is the size of rose you want, leave it to dry, preferably overnight, and then dust with lustre dusts if you want. If you want a bigger rose, brush a line of glue just above the folded edge of the 2nd set of petals you have waiting. Look on the small rose to see where the last petal finished. That is where you will start wrapping the 2nd set of petals from, just slightly overlapping it. Keep the rose upright and turn it at the same time as gently pressing the 2nd set of petals on. I like to let these petals fall open a bit so it doesn’t all look crammed and squashed. That is the next size of rose. Again, tease the petals apart slightly with a dry brush. At this point I gently pinch the sides of each individual petal to shape them into a more realistic shape. A gentle pinch in the middle of each petal edge is all that is needed. You can now either leave that to one side to dry, or make it even bigger for a full bloom. For a rose in full bloom, you just need to add the final set of petals. As before, brush a line of glue just above the folded edge, look for the last petal on the rose, and start wrapping the final set of petals from that point, overlapping it slightly. You now have a full rose. Use a dry brush to separate any petals that are too crammed up, and to lift any that are too floppy. This is where I spend the most time, shaping the petals. Look at a real rose and you will see that they do tend to look like they have been pinched slightly in the middle edges of the petals. They often look like the sides of each petal are curling underneath too. Pinching the petals helps to achieve that look better. Another thing I do to mine is to hold them from the bottom, not touching the actual petals, and give it a gentle squeeze. This pushes the centre up a bit and in my opinion, makes a more natural shape. Not much of a squeeze though, only enough to slightly lift the centre. Leave this to dry overnight. It is now ready to dust with colour or you can use it just as it is. I like to add a bit of colour to mine. If adding colour dusts, make the centre of the rose a shade darker for a more realistic effect. And there you have it! Believe me when I say if I can make one, you can too. I’m not claiming mine are brilliant but I am pleased with how they come out. 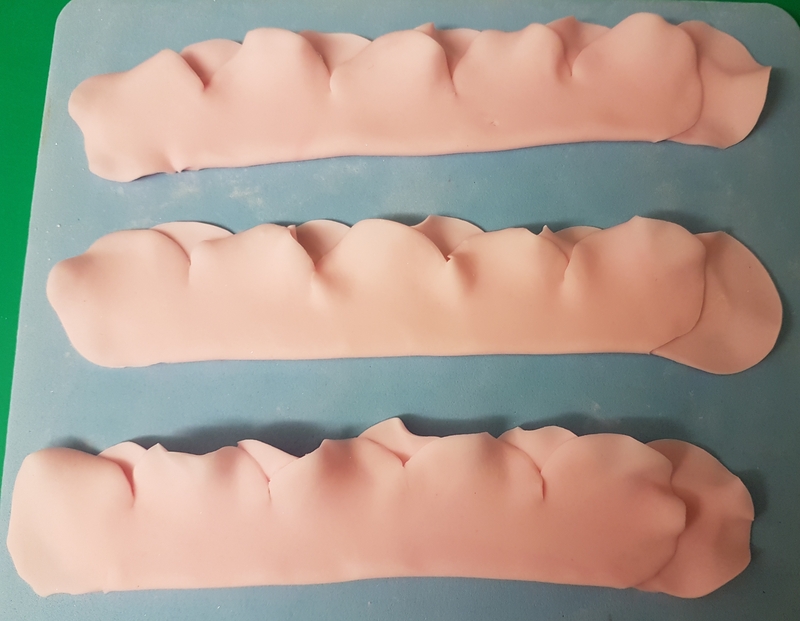 To use them on a cake, just apply a bit of edible glue or royal icing underneath them and position them wherever you want them. or this is The Smaller Easiest Rose Ever set. There are currently 3 other flowers available in this Easiest Ever range and I shall be putting up tutorials for these soon. They will be the Carnation, Peony, and Ranunculus cutters.